One of the most divisive proposed developments in Vancouver in a long time is currently being considered by Vancouver city council. The Rize Alliance Properties development at Kingsway and Broadway promises to radically change the area where Kingsway, Main and Broadway meet. An article from BC Business is in support of this development and offers some insight into the issues. The original development proposal was more aggressive at 26 stories but has since been scaled back to 19 stories following public opposition. 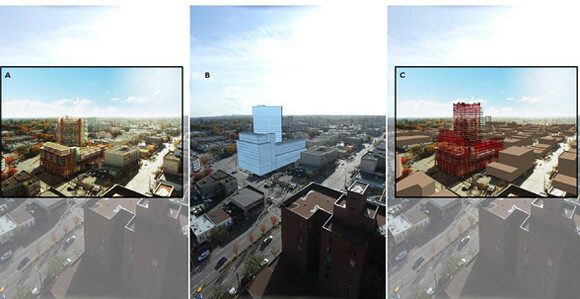 Notice in the renderings above how the building height differs depending on which party it was created by and their particular interest. The rendering closest to reality is likely the one created by the City. It seems to me that this location is an ideal place to increase density since it’s well-located close to public transportation along the Broadway corridor and is a walk or quick bus ride to two Skytrain lines. The anti-development types are unlikely to be satisfied with any proposal put forward but many Mount Pleasant residents are watching this one closely to see what the City will allow.